Experience thrills during a 45-minute speedboat ride across Miami waters. Soar along the Miami coastline in a comfortable speedboat with ample plush seating, taking in views of the city’s spectacular skyline, Star Island’s multi-million dollar mansions, and the stunning Art Deco designs of Miami’s South Beach District. Tours depart hourly! 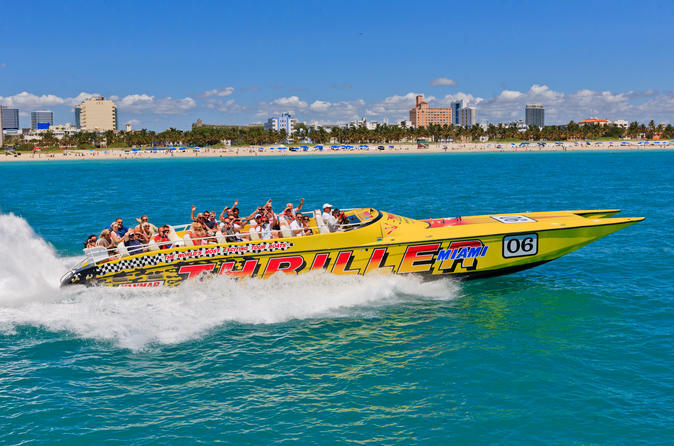 Board your speedboat in downtown Miami’s Bayside Marketplace, then set out for an exhilarating 45-minute tour. Begin with a cruise past the Cruise Ship Channel, Port Miami, the US Coast Guard Station, and Flagler Monument Island before continuing to the Venetian Islands and Star Island, where your captain slows down the vessel to give a brief history of the multi-million dollar mansions at Millionaire's Row. Next, travel between South Point Park and Fisher Island to gawk at the highest per capita income homes of any neighborhood in the United States. Accelerate through Government Cut hitting top speeds before blasting out into the Atlantic Ocean and along beautiful South Beach, admiring its stunning Art Deco district from the water. While returning through Fisherman’s Channel, get ready to take in some of the most spectacular views around of the Miami coastline and relish in an hour well spent.